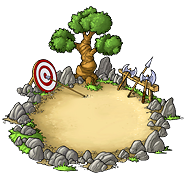 At the tournament square your troops can train their stamina. The further the building is upgraded the faster your troops will travel over longer distances. Each level of this building adds 20% of bonus to speed (up to 400% bonus). This effect takes place after a distance of 20 squares. Note that on servers started in 2018, except Path to Pandora, the bonus is 10% per level. It only affects troops which were trained in the village where the tournament square was built.